Voice your opinion! Review Quality Eyes now. Is Quality Eyes your company? 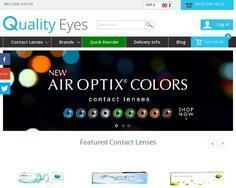 Buy Contact Lenses online from Quality Eyes. We stock Bausch and Lomb, Ciba Vision Acuvue and Clariti Contact Lenses - Free UK Delivery.